Another national news story is brewing in our town. This time it’s about a news agency itself—the (take a long breath) Intelligencer Journal–Lancaster New Era. Yesterday they rolled out a new online paywall they believe will net them $10,000 to $500,000 a year. What’s this paywall, and who will it affect? It’s a $20/year charge to out-of-towners who read Lancaster obituaries like they’re going out of style. Monday morning, the website for a midsized paper in southeastern Pennsylvania became the first to go public with the paid content system of Journalism Online, the startup engineered by Steve Brill, Gordon Crovitz and others. 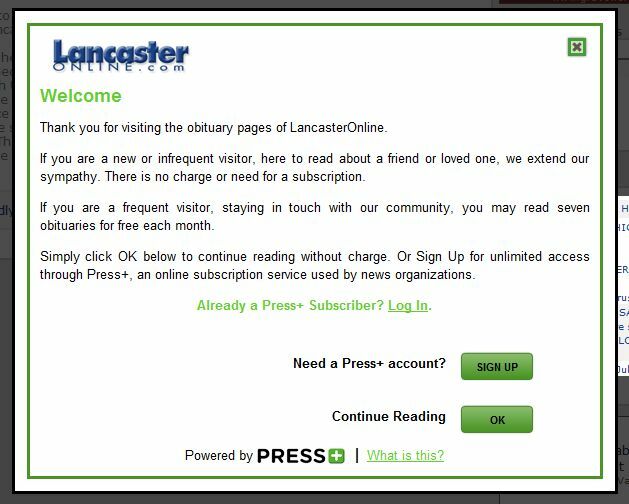 LancasterOnline, which serves the Intelligencer Journal-Lancaster New Era, began informing people who live outside Lancaster County and read its online obituary listings that visiting the obits page will cost $1.99 a month after they’ve viewed seven pages each month. Annual subscriptions cost $19.99. Are they serious? Are there really that many people people visiting the Lancaster site to read obits? Really? The folks in Lancaster claim to have done the math that proves there’s a substantial out of town audience for obits, though it’s based on a lot of guesswork (and probably proves, once again, that journalists really aren’t that good at math). Notably, Lancaster seems to base its projections on traffic numbers from the not-so-reliable Google Analytics rather than on data from the site’s internal logs, which would be much more precise. That seems odd. According to Mitchell’s story, LancasterOnline estimates that 100,000 out-of-market visitors to the site read obits each year. And the site reckons that more than 10 percent of them do it—yes, read obits—several times a week. Okaaaay. Taking the math further, Lancaster estimates that nearly 90,000 visitors to the site read the obits at least once a week, and 17,692 visitors read the obits four times a week. These numbers are preposterous. Remember, this is little LancasterOnline, not NewYorkTimes.com or WashingtonPost.com. I find it hard to believe that Lancaster has that sort of constant, repeat traffic to its obits—or else it’s got an audience with a truly obsessive fascination with grazing news about local deaths. If I were seeking to kill off newspapers (I’m not), I would try to persuade them to charge people to read obituaries online. Apparently that’s the plan of Journalism Online, a profiteer seeking to cash in not only on newspapers’ death wish but on the deaths of their readers. Journalism Online’s sucker in this fantasy-based paywall experiment is the Intelligencer Journal-Lancaster New Era (oh, the irony in that name; I will call it the Old Era for purposes of this blog). Laugh if you want — and I’ll admit, I’m tittering — but any small-town newspaper publisher will tell you obits are a pretty big deal for readers. In this case, LancasterOnline is making money coming and going (if you’ll pardon the pun): they charge survivors to place death notices, and now they’ll charge out-of-towners to read them. This sure sounds like a low-revenue road test to me, but Lancaster Online’s editor thinks they can squeeze $100,000 out of the oldster demographic that keeps up regularly with far-flung deaths. All I have to say is that the people who came up with this scheme are nothing like the cultural creatives who are engineering Lancaster’s future. This is preservationist, reactionary, and, I suspect, based on data that is (excuse the pun) dead wrong. The ash plume from Eyjafjallajokull Volcano, Iceland is an amazing sight. This NASA photograph was taken on Saturday (May 8th). Here’s an amazing thing: At a time when Pennsylvanians are dreading electricity rate increases in 2010, I just eagerly and voluntarily told PPL to charge me more on my monthly bill. And I know I’m not the only one. Welcome to the new economy. Having to pay more for the same old stuff causes revolts. Having the opportunity to pay more for what’s innovative and sustainable engenders loyalty. What I’m talking about is PPL’s new Green Power Option. You should do it. Go to communityenergyinc.com/ppl and choose how much of your household electricity you’d like to come from the renewable sources of wind and hydro. The options start at an extra $2.50 on your bill. Amanda and I are signed up to get about half of our electricity through green power. That will be about four tons less of carbon dioxide into the atmosphere this year. I jumped at the opportunity to enroll in this program. I appreciated having a similar option through PECO when I lived in the Philadelphia area, and I have no clue why it has taken PPL so long to offer a green option here. The idea is simple: If it costs more to generate electricity sustainably, give people the option to pay the extra expense. The green electricity PPL is offering is generated by Community Energy. It so happens that the company is the one that partnered with Temple, Villanova, and my college, Eastern, when as a student body we decided to get 100% of campus electricity from sustainable sources in 2002. I covered the story for our student newspaper as it unfolded. Participating in the Green Power Option gives PPL a financial incentive to continue its emerging set of renewable energy projects. PPL says that about 10% of the electricity it markets comes from such projects. While PPL claims the Frey Farm Landfill as one of its projects, the Lancaster County Solid Waste Management Authority’s website says that what electricity it does not use to power the facility itself, it sells to Met Ed, not to PPL. That’s a shame, because the LCSWM waste-to-energy system is sleek and innovative. For now, I’m just happy that it’s finally within my reach to power my home with energy from green sources. The complete list of places of worship in Lancaster adds up to 170. For the first assignment, each student will be assigned 10 of the listings and must conduct an architectural inspection. Yes, Ethan, Wheatland is on the list. No, Ken, LCBC is not. Also on the list is the Unitarian Universalist church, all three synagogues, and the mosque. It’s a wonderful project, the brain child of preservationist Ben Leech. I met Ben for lunch last week and got to know him a little. The Lancaster Building Conservancy and Ben’s other blog, Old Weird Lancaster, constitute for me a new kind of historical activism or grass roots architectural history. Blogging and the web have provided a platform for exciting and innovative projects. …On this blog, I’ve occassionally been critical of photographic projects (like Flickr communities) because they lack documentational discipline. Ben’s LBC is quite the opposite. The weekly drawing provides the foundation for a well-researched and articulate analysis. I hope Ben’s images have a post-blog afterlife. I hope they turn into an exhibition or a book. Writing of an F&M professor reminds me that I’m curious to learn what Trexler Proffitt is up to with the local stock exchange idea he has been researching. In his weekly Intell article on business openings, expansions, and relocations, Chad Umble highlights Folklore Coffee & Company of Elizabethtown, which opened on Friday. Folklore Coffee & Company is on Twitter.